Several times I observed a cliff wall on the southwest side of Bailly Crater. The highly reflective surface in different time periods and phases reflects the sunlight in two directions. To the north 150km will reach its length. It's just in the third quarter of the Moon. Edited by Csabai István, 11 October 2018 - 05:20 AM. Wow! Nice work. What equipment did you use to get that picture? That's a nice catch! I was looking at LRO images of this region, and located near the apex of your two light streaks is a very small crater that appears to be relatively recent and has a high albedo. There is also a very faint ray system associated with this that is almost invisible under most circumstances. 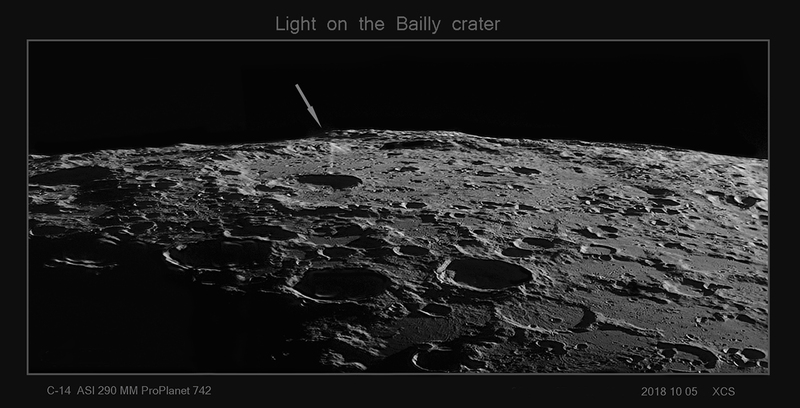 In your image, the light is just catching this crater and ray system enough to highlight the higher albedo in the streaks, and in combination with the higher albedo of the crater rims in its path this makes what appears to be two beams of light. These "beams" are obviously not coming from the sun itself, as the orientation is completely different from the shadow lines within the craters. A very nice effect. Thank you Cali and Tom! Tom is very interesting about your post, thank you.